Cyclists on the MBT. Image by DDOT licensed under Creative Commons. Some day in the not-too-distant future, the Metropolitan Branch Trail will run through Fort Totten on its way up to Silver Spring. It will also run as a separate bikeway near the Brookland Metro rather than sharing space with cars on 8th Street NE. Both the Fort Totten connection and the separated bikeway along 8th Street are key steps toward completing the eight-mile trail, which one day will be a straight shot from Union Station to Silver Spring. Right now, only the southern part of the trail— roughly 5.5 miles— exists, and that's as a mix of on- and off-street sections. The District Department of Transportation recently announced that it's looking for a firm to build and design a section of the trail that will run through Fort Totten. This will extend the MBT a little more than a mile further north to Riggs Road NE from Bates Road NE, its current northern terminus. As this post from the Washington Area Bicyclist Association (WABA) shows, the trail will run just west of the the Fort Totten Metro station, passing over the tunnel for Green and Yellow Line trains. The new section of the MBT in Fort Totten is shown in blue, with the existing trail in green and the on-street route in red. Image by WABA. DDOT director Leif Dormsjo called the request for proposals for the Fort Totten section the “next major milestone” in completing the MBT. The work on the project is expected to take 18 months, and the new segment of the trail could open in late 2018 or early 2019. 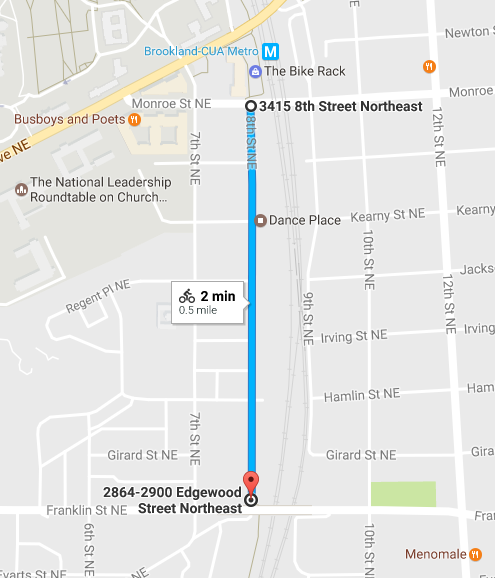 One critical gap in the existing stretch of the MBT is 8th Street NE. There, cyclists have to mix with cars on the half-mile stretch from the Franklin Street bridge to Monroe Street. The 0.5-mile stretch of the MBT on 8th Street NE. Image by Google Maps. DDOT plans to close that gap with an interim two-way protected bike lane on 8th Street, he says. The lane would be protected with plastic posts, similar to those on M Street NE, and it would replace the parking on the east side of the street. The M Street NE protected bike lane connects the MBT to First Street NE in NoMa. Image by Joe Flood on Flicrk licensed under Creative Commons. The protected bike lane is only considered an “interim” solution due to the multiple commercial and industrial uses on the east side of 8th Street, including Annie's Ace Hardware, Hope Community Charter School and Sunbelt Rentals. Long-term, DDOT wants to build an off-street facility as the area redevelops. “It’s not going to be an ideal facility for cyclists, it’s not going to be world class but we think it’s going to be an improvement for everybody,” says Buck. “I think it will be safer for not just cyclists but people driving their cars and walking,” said ANC 5E01 representative Eddie Garnett at the same meeting. I reached out to DDOT to ask about the timeline on the new bikeway and haven't heard back yet. I'll update this post as soon as I do.